The eponymous protagonist of All About Nina has a lot to say. 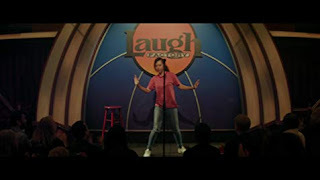 Indeed, she is a comedian in a market dominated by men, and just after our professional introduction to her, by way of a comedy routine, we get to see her interactions with the other stand-up comedians who perform in this particular club. We’ve already seen her routine, which is chockful of sexual innuendo, bathroom humor, and the liberal use of a certain, four-letter word. It’s below-the-belt stuff, but it’s funny, both because her delivery suggests feigning laidback and, well, because it’s so true. It also helps that Nina is played by Mary Elizabeth Winstead in a performance that calls upon the actress to convey a lot through her face and expressions. As such, Nina is clearly repressing a lot within the honesty of her routine. She is forced to suppress a lot, too, in those interactions with fellow comics and the bartender, which are ostensibly veiled excuses to proposition or otherwise harass her. She’s accustomed to the treatment by now, but she still doesn’t like it, constantly rejecting the advances of one particular colleague (played by Jay Mohr) and fighting the institutional sexism that doesn’t welcome female comedians. That is, until she meets Rafe (Common), a newly divorced man of nine years her senior, who empathizes with many of the impulses behind her routines. The best parts of director Eva Vives’ screenplay (or, perhaps in part, the actors’ improvisational abilities) allow Nina and Rafe the opportunity to sit and talk – about their passions, about their insecurities, about their feelings for each other, about why some of those feelings are frightening, and about their dreams. Winstead and Common have immediate and infectious chemistry as actors in these scenes, so that the potential of physical intimacy is of secondary importance. Her home life is abusive, with a policeman husband (played by Chace Crawford) who regularly beats her up, and a secondary plot follows her attempt to find some television popularity by moving impulsively to Los Angeles and auditioning for a program whose showrunner (played by Beau Bridges) sees a lot of potential in her. The problems arise, though, when the weight of the past, brought forth by circumstances in the present, send her down a self-destructive path. The payoff to this build-up is a climactic routine, in which Nina’s insecurities come flooding out of her. It’s a scene both painful and galvanizing, and it comes to sum up the entire point of the film without feeling tacky. Vives’ straightforward shooting style, which refuses to be showy, is gentle until the events of the finale takeover. By then, the actors have taken over, and the final movements of the plot, which provides a crossroads of sorts for Nina both personally and professionally, ring true. It is a familiar plot of demons and vices that anchors All About Nina, but the honesty of the piece is sometimes overwhelming and always courageous.